While working my way through the records discussed in the recent “Chunder Down Under” post I became inspired by the work Tim Channon et al were doing on station quality in the UK, and in a fit of enthusiasm I decided to take a look at station quality at the seven stations I was using to see whether it might have affected the temperature readings. To keep the post down to a manageable length I’m discussing only the Alice Springs results here. The results from the other six stations will appear later. Alice Springs has an essentially unbroken temperature record going back to 1878, but the data come from four separate stations: Telegraph Office: 1878 to 1932 Post Office: 1932 to 1989 Old Airport: 1942 to 1974 Current Airport: 1974 to present I’ll review station quality at these sites in sequence, starting with the Telegraph Office. Here’s a photograph of what it looked like in the early days of operation. From the standpoint of station quality the site looks pretty good – lots of open desert, not many trees, a few low buildings and minimum urban warming potential. Unfortunately, however, there’s no way of knowing where the thermometer was. http://oi48.tinypic.com/alkb4w.jpg Or is there? Sometimes you get lucky. 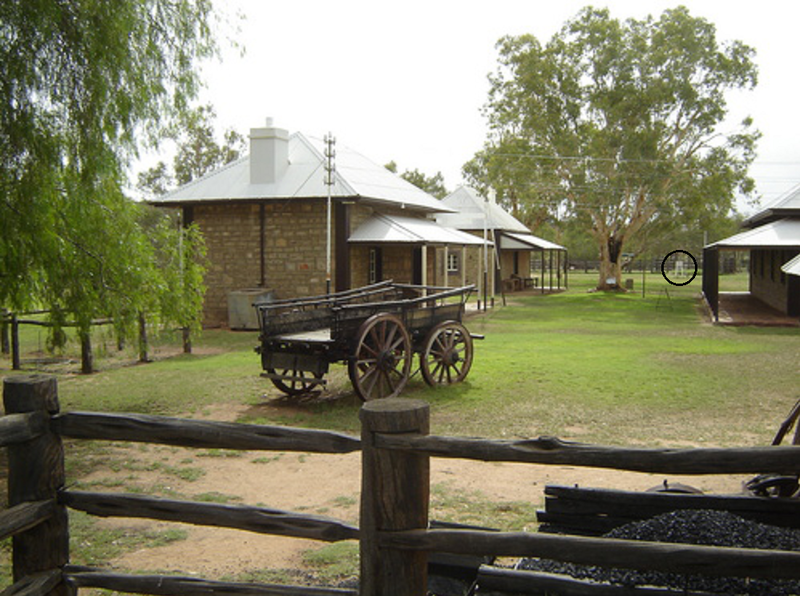 The Telegraph Station has been lovingly restored and is now a Historical Reserve. Tourists go there and take pictures which they post on Google Earth, and here’s one of them. The structure inside the black circle looks very much like a Stevenson screen. (Would the station have had one? Probably. They were being introduced to Australia when it started operation.) http://oi47.tinypic.com/2hn2lv6.jpg And here’s an overhead view. (Google lat-long 23°40’19.76”S, 133°53’15.12”E, elev 589m. I provide exact lat-long coordinates where possible so anyone who wants to locate the site doesn’t have to spend time searching for it. 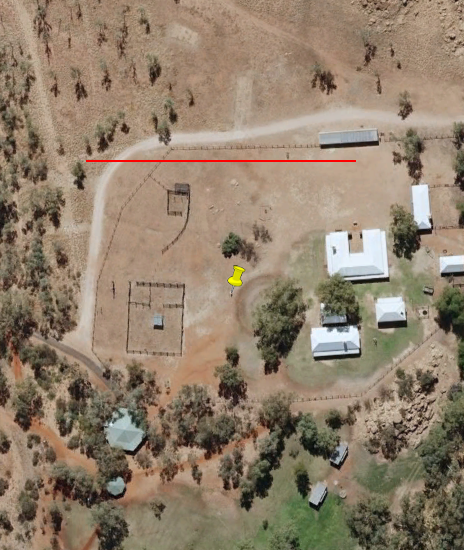 The red line on this and following overhead views is 100m long unless otherwise specified, and north is always up.) http://oi45.tinypic.com/2eaqgoy.jpg Could this be the original screen? Well, it obviously hasn’t been visited for a long time (there’s no path or well-worn track going to it) and there’s no point building a screen if you aren’t going to use it. And the people who restore historical sites tend to be persnickety about leaving things exactly the way they were, so I’m going to assume that this is where temperatures at the Telegraph Station were in fact read for at least some of the time. And the reliability of the readings? Well, the Alice Springs Telegraph Station was for many years a critical communications link between Australia and the rest of the world and therefore wouldn’t have been staffed by incompetents. I think we can assume they knew how to read temperatures. All of which leaves us with at least a reasonable presumption that the Alice Springs Telegraph Station was a high-quality site. One down, three to go. 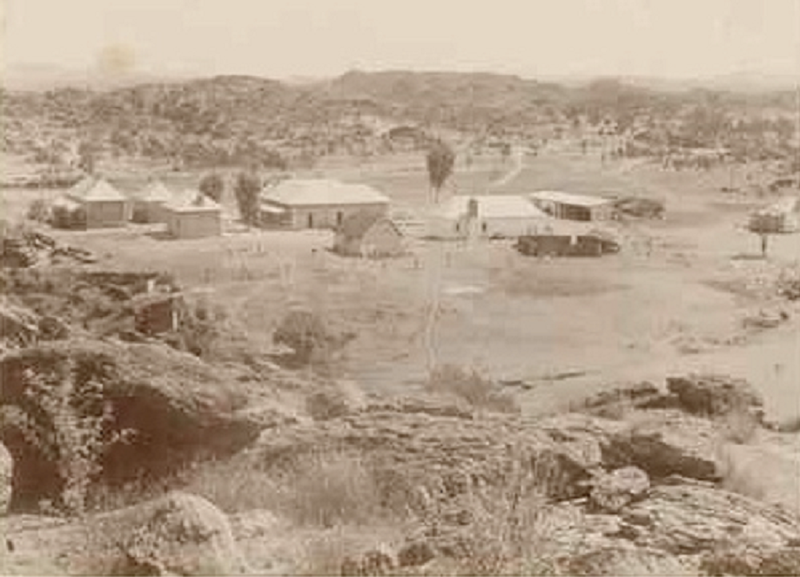 But in 1932 the Telegraph Station and the Post Office that went with it – one was opened there is 1888 – were closed, and a new weather station was opened 3 km south at a new Post Office in what is now downtown Alice Springs. 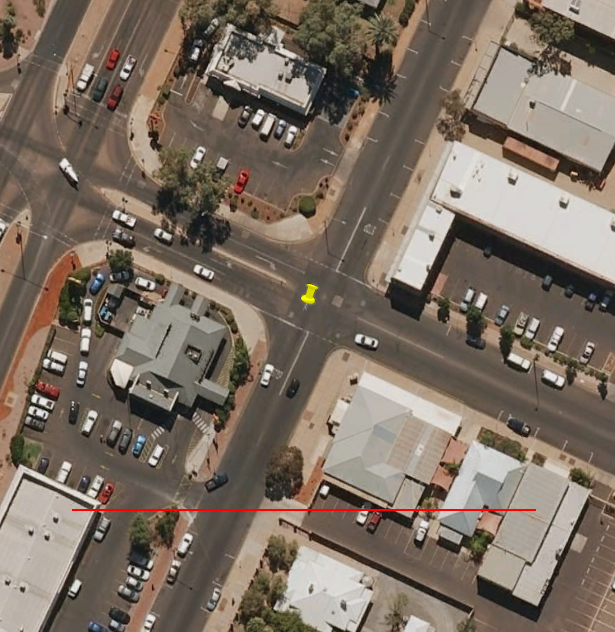 The question, however, is where in downtown Alice Springs. The lat-longs given by the Alice Springs Post Office metadata (here) place the site out in suburbia and are clearly incorrect. 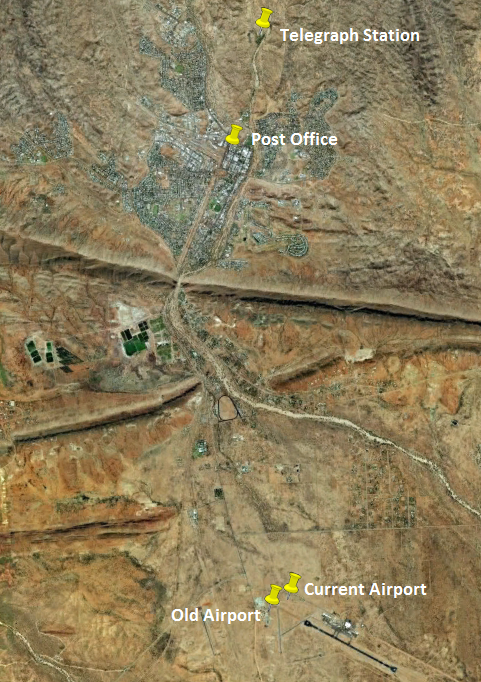 The most likely location is on one of the corners of the intersection shown in the overhead view below (lat-long 23°41’50”S, 133°52’45”E, elevation 581m). There are other possible locations, but all of them are downtown too and they all look much the same. http://oi45.tinypic.com/149tpmx.jpg What this intersection looked like in 1932 is of course unknown, but station quality clearly underwent a significant downgrade when the station was moved there from the Telegraph Station site. Given all the later development in the area it also wouldn’t be surprising if the record showed a spurious “urban” warming gradient after 1932. The Post Office station kept reading until 1989 but was supplanted in 1942 by readings from the area’s first official AMO station, located at what is now known as the Old Airport about 10km to the south. 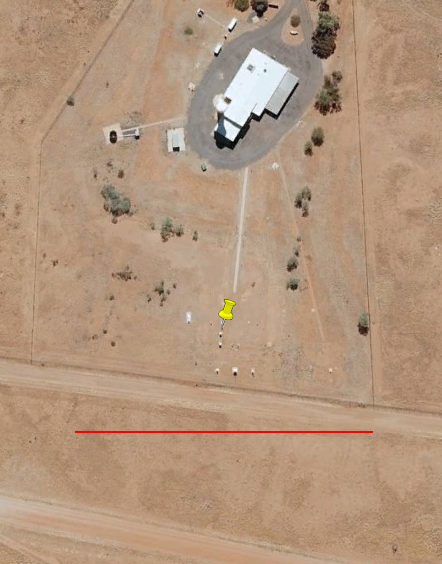 The exact location of the screen at the Old Airport is also unknown (there are no separate metadata for the station) but it would have been somewhere around the pin on the left edge of the overhead view below (station elevation 548m, easy to find so no coordinates given). The view also shows the location of the current Airport weather station and the Airport itself for reference. http://oi45.tinypic.com/707sk1.jpg What would the quality of the Old Airport station have been? It’s not hard to visualize what the area looked like 70 years ago – a runway, a few buildings and a lot of desert. So provided the thermometer was properly screened and not nailed to the side of a building or stuck on a pole under the shade of a coolibah tree station quality should have been good. The uncertainty, however, is how close the screen was to the hardstanding, which was pavement of some kind (you can see the cracks when you zoom in) and which was probably there while the station was operating. So this station could have been anywhere from good to bad, there’s of way of knowing. 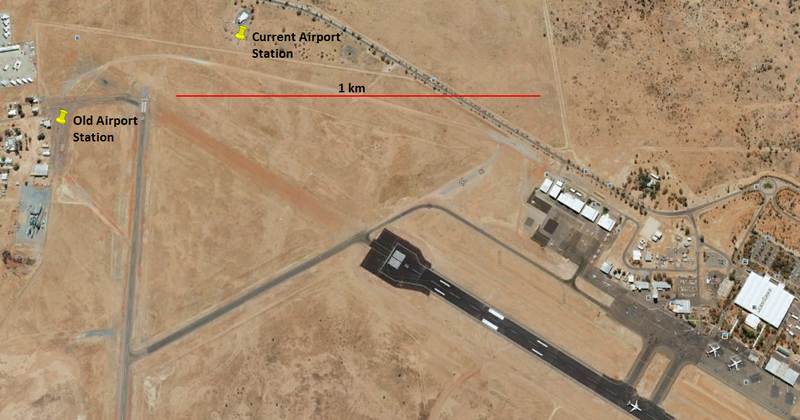 In 1974 the station was moved about 600m northeast to its current location at Alice Springs Airport. (Google lat-long at pin 23° 44′ 44.71”S, 133° 53′ 20.21”E assuming the pin is on the right white dot, elevation 547m, Metadata here🙂 There was a “major refurbishment” of the station in May 2001 but no record of a station move or equipment replacement at that time. http://oi49.tinypic.com/1ioqz4.jpg I don’t think this station makes WMO class 1 because it’s too close to the blacktop driveway around the AMO office building, but it’s certainly high-quality. To sum up, temperatures at Alice were measured at a (probably) high-quality station between 1888 and 1932, at a low-quality station between 1932 and 1942, at a station of indeterminate quality between 1942 and 1974 and at a high-quality station since then. Here’s a view showing where the four station are in relation to each other. 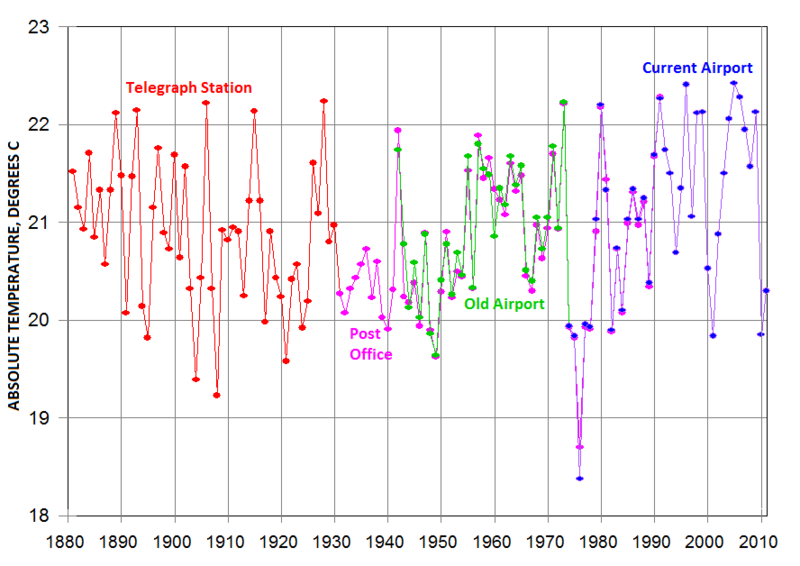 The Telegraph Station and the Airport Stations are 14km apart: http://oi47.tinypic.com/sgj32c.jpg Having gone as far as we can with station quality let’s now compare the raw temperature records from the four stations. The Telegraph and Post Office records are combined into a single record in the GHCN v2 raw data set, which they shouldn’t have been, and so are the two Airport records, but I’ve picked the four records out in different colors to show where one starts and the other stops: http://oi45.tinypic.com/2nbx5yx.jpg My immediate reaction on seeing these results was that someone must have massaged the data. But the more I looked into it the less likely it seemed that anyone had. The Australian National Climate Center provided the Australian raw records and could have done the massaging, but it would have been a big job to massage all the individual Australian records and there are a number of instances where it’s clear that no massaging was attempted. 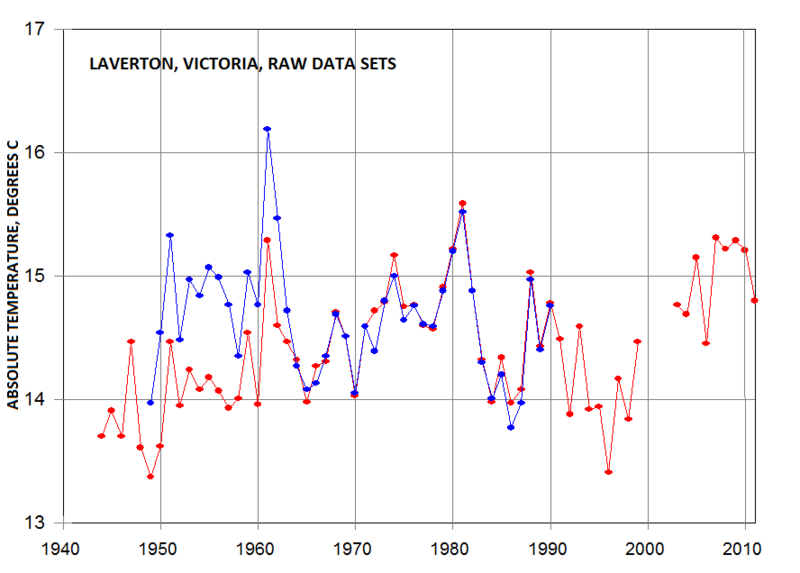 An example is Laverton: http://oi47.tinypic.com/1ranad.jpg Peterson & Vose 1997 (here) could have done it when they put the raw records together in the GHCN v2 data set, but there’s no evidence that they did. They were in fact motivated to leave the raw records intact so they could have fun “homogenizing” them once the data set was put together. GHCN v2 also contains records that show some very large and obviously artificial discontinuities, and in the only case I came across where P&V did massage the raw data it was obvious that they’d done it. http://oi48.tinypic.com/10ohapv.jpg Another possibility is that the Alice Springs record was massaged after it was entered into GHCN v2 in 1997, but the record I downloaded from GHCN v2 in or around 1999 is effectively the same as the 2012 version, so unless it was massaged quickly we can discard this possibility. 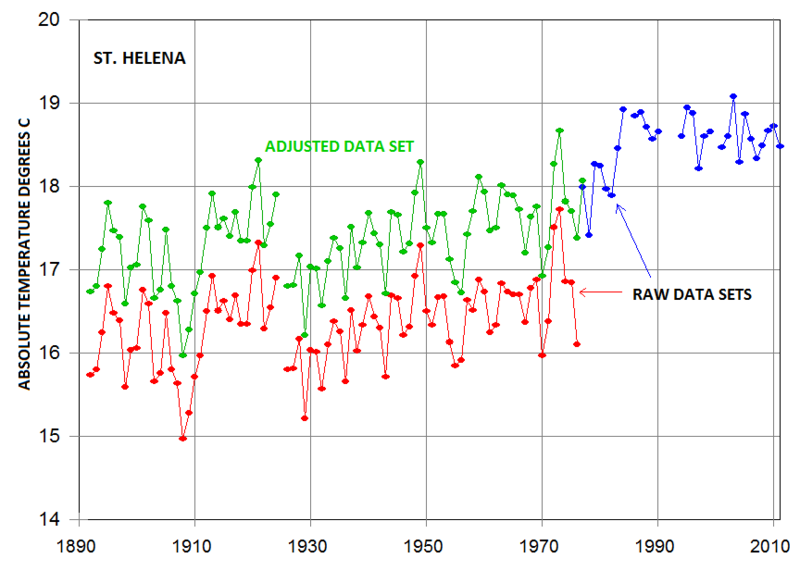 (The Australian GHCN v2 records indeed were massaged at some time between 2000 and 2004 and then massaged back again at some time after 2004, but that’s a separate issue.) Yet another possibility is that the people who put the Alice Springs paper records together adjusted them to fit each other, but this would have involved altering thousands of readings, so I think we can discard that one too. Finally there’s the question of whether we would expect any large differences in absolute temperature between the four stations, all other things being equal. The Telegraph and Post Office stations are slightly closer to the Equator but also slightly higher than the Airport stations to the south, so I’m not sure that we would. So what are the conclusions? First that the Alice Springs temperature record is OK, and second that changes in station location and quality have apparently made no difference to the long-term continuity of the temperature record. Does this apply to the six records around Alice Springs too? Coming up. The Post Office station kept reading until 1989 but was supplanted in 1942 by readings from the area’s first official AMO station, located at what is now known as the Old Airport about 10km to the south. If only all station moves had a period of overlap. I’ve flipped the pin to top flag on this one and probably unpin to other one. We are trying to manage the front page. I’ve added a note at the bottom of the article with a link to a zip file containing various version of the Alice Springs monthly data. I suspect there is very little difference between them, I’ve not looked. In the past I found some stations vary, some, tend to be high profile, are not. Thanks for the link, but my winzip program has been corrupted by malware and I can’t use it any more. Is there any other way of getting the data? I don’t need GHCN v2 because I’ve already got it. Thanks. So Alice Springs looks as hot as it did when the first guys, without air conditioning arrived, and warmer than in 1935 … but would anyone or any animal or plant have been concerned/aware of the difference? If anyone wants to know how to do this is the stuff, pull the files, GBs of data there, is an article or reference page. Decode is not a lot of use because it is lua script. The obvious data are Post Office and Airport. Decodes to Tmin, Tmax and I crunch Tmean. Ten year data overlap. Awkward to do anything with such large data. A very quick twiddle, I’m tired. Lines are data mean. Overlap does not match accurately. Considering this is filtered the noise is surprisingly large. Hope i have got my fingers right. (I wrote the software but brains fade) End corrected so don’t trust the very ends. I could put up the two decodes. I wondered about a measure of exposure, minima. Looks like the datasets are wonky, I don’t buy the following. This is very simple, for each year sum the daily Tmin if it is below zero. This mentions 1976 so presumably the same data. The graph above shows a lot more below-zero days at the Airport station after 1974 than before. This change coincides with the station move from the Old Airport site to the current Airport site in 1974. You see it in the diurnal ranges too. Mean temperatures didn’t seem to change significantly after the move, so I think what may have happened is that the Old Airport site was in fact fairly close to the hardstanding, keeping it a degree or so warmer at night, and maybe partially shaded, keeping it a degree or so cooler during the day. I don’t think there’s necessarily anything wonky about the data. I guessed that was when there was a move, description as “airport” being used loosely. My usage of wonky is perhaps unwise with an international audience. Your plot and article shows the published data is being “passed off” as single station/site when it is not. GHCN does know the difference. Your article is good, chasing back history is extremely difficult. The fact that GHCN combines different stations in the same record means that we have to do a little historical research to put the record straight, if you’ll excuse the pun. But it’s not really that tough. 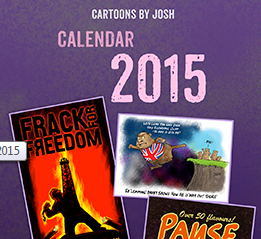 All kinds of info is available now on the web. Anyway, it’s nice to know that one of the four station moves did generate some identifiable physical impacts. I was beginning to think that station quality and location had no impact on anything. Do you plan to do any of this type of work with the UK stations? It might be an interesting exercise. You did say. I was acting with a blind eye and assumed you would confirm any date match. I’m afraid it is not possible to do UK stations. I will probably try to piece together what can be done. This is why I seem to piece together data fragments from strange sources, it’s all there is.